Preheat oven to 175°F. Pour oil into a small ovenproof saucepan; gently place egg yolks in oil, and bake in preheated oven 1 hour. 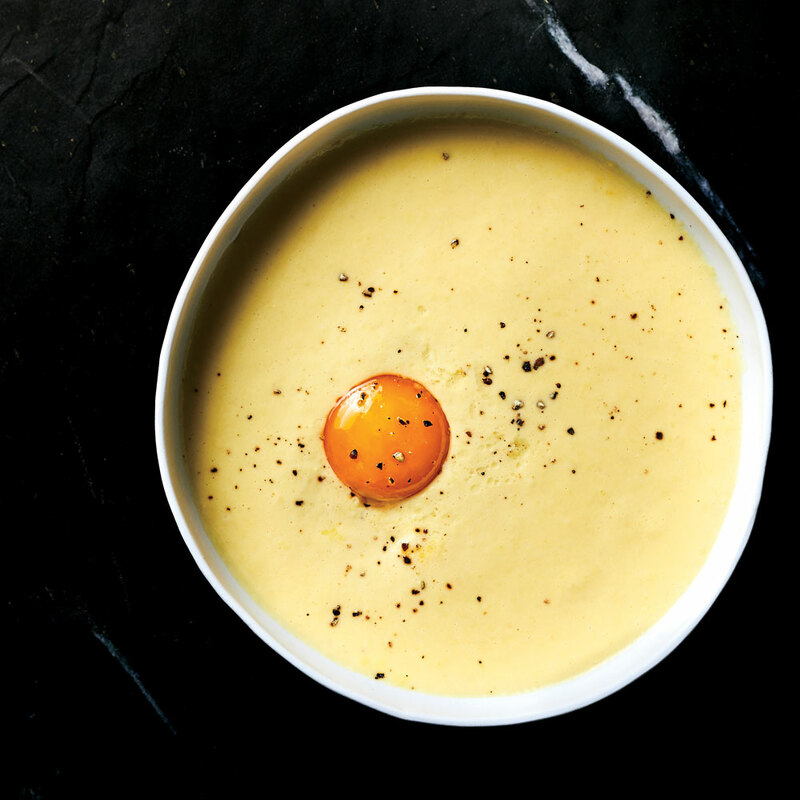 While yolks bake, combine corn cobs and milk in a large saucepan, and cook over low, stirring occasionally, until milk is infused with corn flavor, about 20 minutes. (Do not allow milk to boil.) Remove from heat, and let stand 10 minutes. Pour mixture through a fine wire-mesh strainer into a bowl. Discard solids, and set aside. Stir together onion, butter, and salt in a wide, lidded skillet over low. Cook, stirring constantly, until butter is melted, about 1 minute. Stir in corn kernels. Partially cover, and cook, stirring occasionally, until vegetables are tender, about 15 minutes. Remove from heat. Combine onion mixture and 2 cups corn-infused milk in a blender. Remove center piece of blender lid (to allow steam to escape); secure lid on blender, and place a clean towel over opening in lid. Process until smooth. Season to taste with salt and sugar. Divide mixture evenly among 6 warmed soup bowls. Nestle 1 egg yolk into each bowl. Sprinkle with pepper and serve. Review Body: What happens to the other two cups?